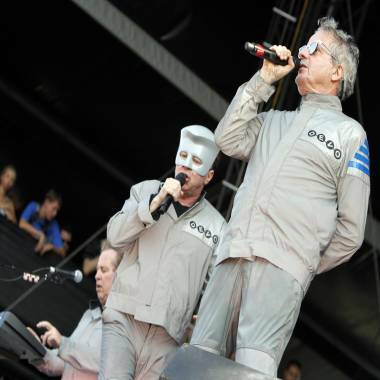 Devo at Lollapalooza in Chicago on Aug. 6, 2010. Devo's Jerry Casale wants it to be known that their newest song, "Don't Roof Rack Me, Bro," isn't meant as a partisan statement -- even though it viciously mocks Mitt Romney for strapping his Irish Setter, Seamus, to the roof of his car for a 1983 family vacation. "This isn't a red-state thing or Devo stumping for Obama," he says. "But I think any animal lover that hears the story will learn so much about the character flaw of Romney. It's just a deal-breaker about the man. My God, the world is a scary place with seven billion people. What you want in a leader is a guy with some humanity at his core. I just don't feel that Mitt does." In 2008, Devo did a fundraising show for President Obama in their hometown of Akron, Ohio. Does Casale approve of his job performance over the past three-and-a-half years? "No!" he says. "Absolutely not. Devo are not naive people. If anyone still thinks that the President of the United States of America runs things, they really live in the Wizard of Oz-land. My God, we're a plutocracy. We're owned and leveraged by global corporations." He still plans on voting for Obama, though. "That's the safer choice," he says. "Believe me. If we have real choice. There isn't freedom of choice anymore. The difference between the two parties is like the difference between Pepsi and Coke." "Don't Roof Rack Me, Bro" has already gotten more attention than Devo's 2010 LP, "Something for Everybody." "That album had Warner Bros. and a brilliant marketing team behind it," Casale says. "It never got us anything like we did with this song. It's topical and we really tapped into something." There are no plans for any future recordings, but Casale is quite open to the idea of posting anything they might record on the Internet. "The promise of the Internet and digital distribution is that things can be instant and topical," he says. "It doesn't need to be from the old-school publicity mill. You can respond quickly, guerilla style. For years that was more a theory than a reality. Finally, I see there is a democratization of getting an audience." Devo tend to only play a handful of shows a year, but this fall they are touring America with Blondie and then later heading to Australia. "We usually only do a few shows because [Devo frontman] Mark Mothersbaugh doesn't like touring," Casale says. "The rest of us love it. But Mark liked what was coming up and he liked these dates ... People expect us to come onstage with walkers, but we can really still bring it." Devo's setlist is primarily drawn from their classic late 1970s/early 1980s catalog, but "Don't Roof Rack Me, Bro" might make it into their live act. "The momentum is already building and we're going to rehearse in a week," Casale says. "That doesn't seem outside the realm of possibility at all." They're also creating an iPhone app for the tune called the Crate Escape -- a game where players attempt to free Seamus from his crate.